Scribbles from a midnight diary: New photos are up! I've put up more of my (artsier) Cambodian photos on the photoshelter site. There is a gallery for the temples, people and nature. And if you're so inclined, you can purchase them!! Yes, I know it's Christmas time and your dear sick mother needs new socks so I'm okay if you would rather throw your money somewhere else. 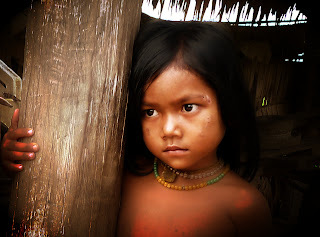 This shy girl was photographed during one of my trips to the Cambodian countryside.